Home » Inside SPHP » Young Sunnyview Patient Improves Balance Using Ekso Bionics Exoskeleton System; Nothing is Going to Stop Him! Nineteen-year-old Otto Miller dons the Ekso Bionics Exoskeleton System, a robotic-like suit that helps him relearn how to balance and stand upright again. Physical therapists Erica Gauthier (l) and Bridget Rourke assist Otto during a therapy session at Sunnyview Rehabilitation Hospital. Eighteen-year-old Otto Miller was a graduate of Queensbury High School. His number one passion was playing ice hockey and he had been recruited to play for the University of Maryland Baltimore County Retrievers. But on January 26, 2016, two days before he was set to move into his dorm for the spring term at UMBC, Otto suffered a terrible accident falling 30-feet off a roof while shoveling snow after a bad storm. Paralyzed from the waist down, he had broken his neck and back, and severed his spinal cord. Fast forward. A year later and now age 19, Otto is working on moving forward in what is a new chapter in his life. A strong young man with an even stronger spirit, Otto has survived major reconstructive surgery and surgery on his neck vertebrae, and months of rehabilitation at a facility in Atlanta. Now Otto goes weekly to Sunnyview Rehabilitation Hospital in Schenectady for rehab. There he gets into a robotic-like suit called the Ekso Bionics Exoskeleton System. The leading edge technology is designed to help get patients up and mobile earlier. Ekso features variable assist software which enables therapists to make quick adjustments individual to patients so that each patient can utilize their existing strength. Additionally, adjustments can be made as the patient’s strength progresses. “Otto is using our Ekso system which we use for gait retraining. He’s using it to learn how to balance and so he can translate that to walking with leg braces which he’ll be able to use at home,” said Erica Gauthier, physical therapist at Sunnyview who works with Otto. Sunnyview was able to acquire the technology last summer thanks to philanthropic support from donors. The rehab hospital began using the system with both inpatients and outpatients, including those with incomplete spinal cord injuries, stroke, and hemiplegic patients. 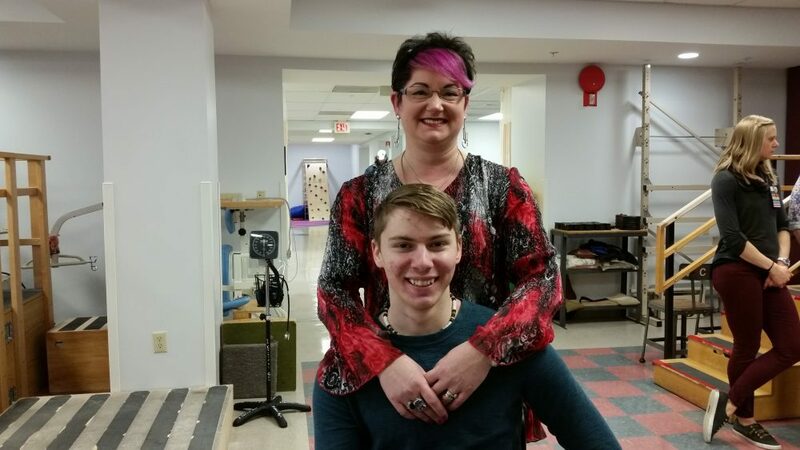 Pictured: Sarah Miller with son Otto at a recent rehab session at Sunnyview Rehabilitation Hospital. “It is okay to fail, but not okay to quit,” said Otto, quoting the renowned author and motivational speaker Chris Gardner, whose book “The Pursuit of Happyness” was turned into a movie of the same name. Garner, who was once homeless, slept with his toddler son on the floor of a public toilet and on park benches when he was down on his luck. Today, Garner is a multi-millionaire businessman and philanthropist. Like Gardner, Otto vows to move forward. With an outpouring of community support and donations, Otto’s parents have turned the family’s garage into a semi-independent apartment with accommodations to fit their son’s needs, including a large bathroom, small kitchenette, special closet and a front entrance with a ramp and a lift.